1) The technology is advanced: adopt the automatic and continuous equipment, all the main processes are controlled by computer, the quality can reach the industry standard in China.The fireproofing Grade:B3. 2) The weight is light: the weight of per square meter sandwich panel is 10~12 kg. The performance in heat reserve and heat insulate is excellent: thermal conductivity λ=0.032 KW/m.h.℃. 3) Good rigidity: because the core materials are shaped, then heat and press them, stick to the upper and the lower surface steel sheet. When the panels are shaped, it has good integrative performance; and also there are wave shapes on the surface of the roof panel, they are stronger than the other same kind materials. 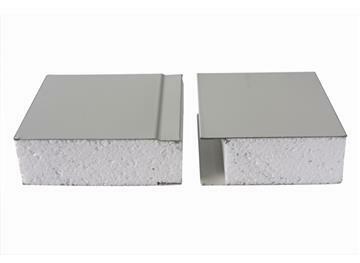 The sandwich panel is fixed by the connection and the purlin, then the whole integrative rigidity will be enhanced higher, the whole roof and the wall panels will be enhanced to work well. 4) The way of fixation should be tight well and reasonable, the roof panels adopt the M6 self-trapping screw to fix to the purlin, the self-trapping screw will be set on the wave position of the roof panel in order to avoid leaking. And the self-trapping screw adopts the special constitution, for example the screw adds the whorl constitution and the screw cap add the plastic to protect, in order to reduce the possibility of leaking. 5) The way of fixation shall be reasonable; the panel will buckle each other, and then avoid the leaking from the roof panel and save the fittings. 6) Protect from scratching: we could use the polythene film on the sandwich panel when they are processed, in order to prevent the surface of the steel from scratching when install and transport.